The Cumberland Valley of PA offers so many events and activities nearby that you will need to stay at 30 Timber Road Bed & Breakfast a few extra days to experience all of the fun. Start with a hike on one of the best hiking trails in the country – The Appalachian Trail. For your convenience, we offer shuttle service to trail heads. Learn about the AT’s history at the Appalachian Trail Museum at Pine Grove Furnace State Park. We also have trails cleared on our property for short walks in the woods. We offer seating at various places along the way for quiet meditation or to help you get to know each other better. Experience world-class fly fishing in local limestone streams. These are the waterways where several experts “wrote the book” about fly fishing. For great fly fishing gear and clothing, visit the new TCO Fly Fishing Shop in Boiling Springs! These folks know what you need for a great day on the water and can tell you about stream conditions and hatches of the day. We can also set you up with a guide for your experience on The Yellow Breeches, the LeTort Spring Run, or Big Spring. Tom Brtalik of Tom’s Fly-Fishing Service, knows these streams and will provide you with wonderful guide work. Take a “Snow Day” and go downhill! Or fly through the trees on a Zip Line. Roundtop Mountain Resort has a great snow-making team to provide you with a wonderful skiing experience. But the fun continues into the summer and fall months! Bring your bike for some great riding! The Harrisburg Bike Club is one of the largest bike clubs in the nation. We have cue sheets for rides around the Mechanicsburg/Carlisle area for beginners to experienced riders. Bring your canoe or kayak for some special time on the water. 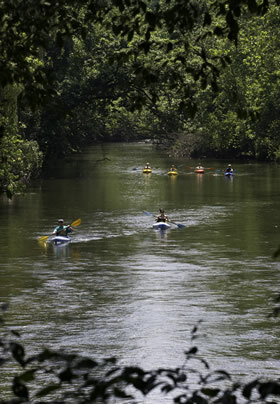 The Conodoquinet Creek, the Yellow Breeches Creek, and several PA State Park lakes are all nearby and waiting to soothe you or to challenge your paddling abilities. We can share in the shuttling of drop-off/pick-up points. Maps of the “water trails” are available at the B&B. If you are a golfer, be sure to bring your clubs to play on some of our local courses. With views of the Blue Mountain Ridges and the South Mountains, golfing can be a relaxing, enjoyable experience. Try Rich Valley Golf Course, Armitage Golf Course, or Eagle View Golf Course for challenging local courses. If roller coasters are your thing, HersheyPark is only 35 minutes away. 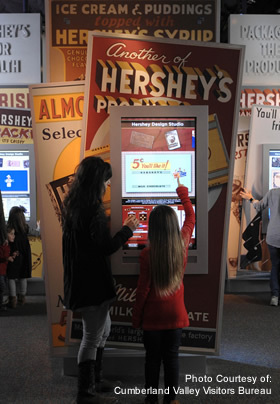 AND you can make your own chocolate bar at “The Hershey Story” too. While you’re in that area, visit Hershey Gardens – stop and smell the roses and get a “butterfly kiss” at the Butterfly House. The Cumberland Valley holds a huge place in American History! The Army Heritage and Education Center hosts living history weekends where costumed participants educate you about life in the army throughout America’s history. The outdoor one-mile trail has displays showing equipment and structures used by the Army from Revolutionary War times to recent desert conflicts. Walk through WWI foxholes, see helicopters used in the Vietnam War, or check out a WWII era barracks building. The Soldier Experience display in the indoor museum offers you the opportunity to strap into the harness of a parachute and learn more about life as an American soldier. Carlisle Barracks was the home of the Carlisle Indian School – where Jim Thorpe established himself as the greatest athlete of the 20th Century. Go to the Cumberland County Historical Society to learn more about Jim Thorpe. The museum in Carlisle tells the story of life in the Cumberland Valley through the years. See displays of furniture, printing equipment, fabrics and quilts – all items made and used in our area. Mechanicsburg is home to several wonderful museums hosted by very knowledgeable docents. The hosts love to tell the story of Mechanicsburg – so named because it was a repair center for wagons traveling through the area as settlers headed west in the 19th century. The Cumberland Valley has a huge place in American history. Visit the Cumberland Valley and learn more. Shop ‘til you drop! Our local craft shops, art galleries, and antique shops give you plenty of opportunities for “retail therapy”! If Outlet Shopping is “your thing”, find bargains at the Tanger Outlets at Hershey. See the best local art & craft shops below. In Carlisle – The Carlisle Theatre offers live concerts and musicals. They also show independent films through their Hollywood on High movie series. Ask your innkeeper about free movie and popcorn with your stay at 30 Timber Road Bed & Breakfast. In Shippensburg – H. Ric Luhrs Performing Arts Center at Shippensburg University offers big name performers and student performances. In Boiling Springs – Allenberry Playhouse has live theatre presentations of old favorite musicals and plays performed by professional actors. In Mechanicsburg – Little Theatre of Mechanicsburg offers shows performed by local, volunteer actors. Fun shows in a tiny theatre! In Camp Hill – the Oyster Mill Playhouse is another local theatre dedicated to allowing local amateurs to perform on stage. In Harrisburg – Whitaker Center for Science and the Arts has an I-MAX theatre, live theatre (including the Central PA Youth Ballet performances), and a science learning center for young and old! The Forum, Harrisburg offers performances by the Harrisburg Symphony. Hershey Theatre, Hershey Arena, and Hershey Stadium are other venues that offers great concerts, plays and dance performances. You deserve to be pampered for a day at SPAtacular Escapes. Enjoy a massage, get a new look with a complete salon experience, and spend some time in the cafeteria. You can find lots to do – out and about in the Cumberland Valley and all just minutes from our bed and breakfast.